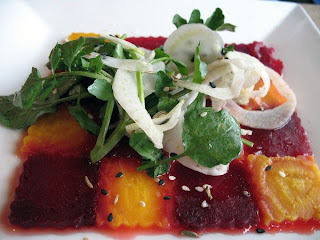 These wonderful beets are simultaneously sweet and tangy. In Georgia, Cornelian cherries are used, but our tart domestic cherries provide similar savor. Chogi is usually eaten warm or at room temperature. Scrub beets but do not peel. Bake until tender, 1 to 1 1/2 hours. Meanwhile, saut? the onion in butter until soft, 10 to 15 minutes. Simmer the cherries in water until they are very soft, about 15 minutes. Force through a sieve or food mill, adding additional water, if necessary, to make 1/4 cup of thick sauce. When the beets are ready, peel and slice them thinly. Place in a bowl and add the cooked onion and cherry sauce. Stir in the minced herbs and salt.